Printing parcel tape with your company logo is incredibly beneficial, in more ways than one. 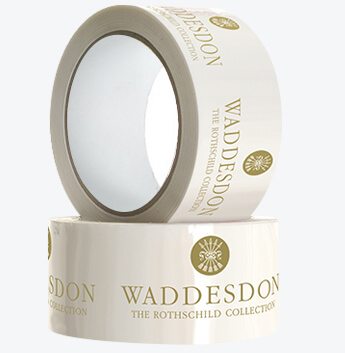 Creating your own custom printed packaging tape and sending boxes or parcels sealed with logo printed tape, ensures your brand is advertised far and wide, wherever the package may go. Our vinyl printed tape is suitable for use in all conditions, has silent slow release characteristics, as well as the ability to tear using your own fingertips. Easy as ABC. 187mm, 237mm, 287mm, 342mm and 403mm. Flood coating available for an additional cost, note that this is not seamless. Printing Costs do not count towards discounts or free delivery. Setup charge is a one off charge. Choose from our range of parcel packaging tape, including white & clear vinyl tape with various cylinder size options. Once approved, your product will be over-printed and delivered within 15 working days.